With the recent explosion of smart speakers, it can be tough to figure out which one’s right for you. So, we’ve decided to test them all - starting with the Google Home. We got our hands on the original Home, which has since been followed up by the Home Mini and the Home Max. In this review, we break down the Google Home’s design, sound, packaging and accessories, specs and more, as well as how it compares to other models. 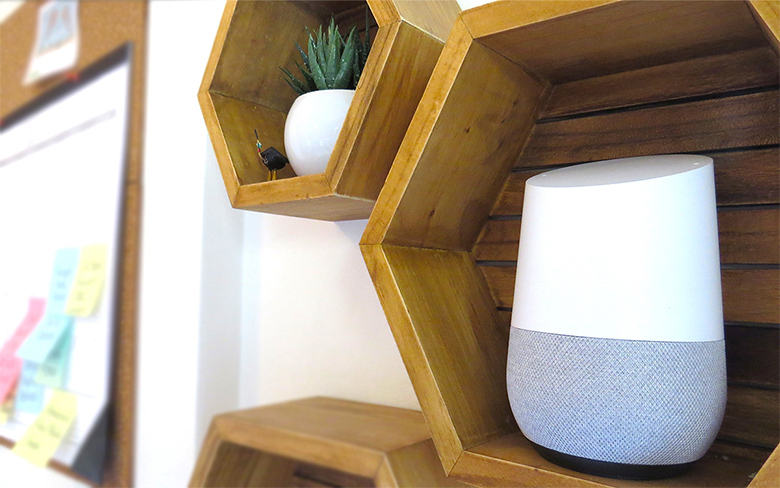 The Google Home is portable, minimalist, and understated in a way that lets you fit it anywhere in your home. That’s a true godsend in comparison to some of the uglier looking gear we’ve seen. The Home looks smart, and the plastic housing feels smooth to the touch, inviting you to roll it around in your hand. It’s lightweight, and fits nicely in shelving, or even used as a desk ornament. The original Google Home comes in white and grey, but you can now purchase a multitude of colored bases through the site, if you want to switch it up. However, as much as we like the design, it's clear that someone at Google got their inspiration from the Glade Air Freshener - seriously, we put the two side-by-side and we could barely tell the difference. Roughly two thirds of the Home is dedicated to the mechanics and tech, while the 2” speaker driver exists in the seemingly forgotten remains (we’ll talk more about how this affects the sound later). Though it may have a pretty surface, we’re not necessarily giving it an Editor’s Choice Award for functionality. The top of the device is an LED touch pad with disappearing display, which can be tough to spot if you aren’t aware of it. It lights up with the traditional Google colors when you turn it on, and is actually the physical control for the speaker. We highly suggest figuring this out before you try to use the Home, as this is the main volume control, and pause/play function. We spent quite a bit of time yelling “Stop, Google. Stop!” before we discovered it. Before you can even start using the Home, you have to download the Google Home app, as well as the Google Assistant app. Yes, two apps. You’ll find out just how adamant ‘she’ is if you don’t follow the instructions. The Google Home app is where you link your Google accounts, calendars, streaming services, and the like. This is also where you’ll find the main remote for the Home, as well as ways to personalize your experience. Unless you want your Google assistant yelling the news at you each morning, we recommend switching off that function in your settings. The Google Assistant app, although very similar to the Google Home app, is where you can communicate with your Assistant, find settings for your personal info, and preferences, as well as a long list of other options like Shopping List, Shortcuts, and Home Control. There are so many options that it’s almost overwhelming, but a lot of them are useful if you already run your entire life through Google and its devices. If only they could combine the two apps, life with the Home would be a whole lot easier. Although we warmed up to the LED touch pad, we did find one major design flaw with the rest of the Home’s controls. You’d think a large, intelligent company like Google would be able to sync volume between platforms and apps, but nope. Besides physical or voice commands, you can only adjust the volume through the Home app, or the streaming app you’re using. We’ll use Spotify as an example here. If you want to adjust your volume in Spotify, you have to: open the app, click the Devices menu, make sure you’re connected to the Google Home Chromecast (yes, there’s a Chromecast and a Bluetooth option for your speaker), and then use your phone’s volume controls. What? Why can’t you just use the volume up and down on your phone without opening any apps? It may have something to do with separating the phone’s overall sound output from the music specific output, which we can appreciate - this lets you watch videos on your phone without having to pause music. It's a useful feature, but also frustrating if you just want to adjust the volume. Despite that inconvenience, we were impressed by how accurately the Home responded to voice commands (once we figured out that “Stop, Google” wasn’t a real command). Google certainly made a huge improvement on voice recognition compared to the majority of voice controlled anything on the market. ‘She’ has yet to play the wrong playlist or misunderstand us: a huge plus for those of you who loath the never ending sass-battle with Siri. The microphone on the Home also works from a distance, meaning you can yell commands from another room in your house without issues. Perfect for lazy mornings. If you’re freaked out by devices listening to your every move, this is not the smart speaker for you. ‘She’ is always listening. There’s a microphone on/off button on the back of the Home, which disables its ability to hear you, but this also negates the voice command option. And makes the Home a lot less useful. The creepiest part about this speaker in particular is that, if you go into your Activity Log within the Google Assistant app, you can actually play back every voice command you’ve ever made. Not just the transcription or your words in a robotic tone: your actual voice. If you’re not into the whole Big-Brother thing, you might want to reconsider purchasing a smart speaker in the first place. It’s going to sound a lot like we dislike the Home here, which really isn’t the case. It’s become our dedicated daily office speaker, but more for convenience than quality. And, like most smart speakers, the main focus of the Home is not audio. You’d think it would be, since you’ll be using the thing to play hours of music. But no. Sadly, the Home followed the same trend as those before it, and dedicated potentially less than half of its function to playback. Inside the base of the Home sits one 2” speaker driver and two 2” passive radiators. That’s it. Based on the size of the unit, and the amount of mechanics/tech put into the design, they probably could’ve squeezed a couple more in there - even the Triple Driver Over-Ears (full review) from 1More managed to fit three drivers in each earphone. Yes, we know they aren’t the same tech - the 1More uses balanced armatures versus the Home’s dynamic drivers - but still. We think Google could have tried a little harder. However, the Home still produces a decent volume level, despite its small stature. If you live in a studio apartment - like the majority of us in larger cities with obscene rental markets - or have a smaller office space, this speaker will do you just fine. For larger environments, we would suggest using the Home to power one room at a time, as it can’t get loud enough to hear from a distance. Plus, if you blast the volume, you tend to lose a fair bit of quality, and your tracks start to sound like a bad afterparty mix. Fortunately, for those of you interested in multi-room functionality, you can use the Home as a master control for most Chromecast-compatible speakers. Like the Solis SO7000, which we’ll be reviewing next week. One thing we’ll give the Home is that it’s a bright little speaker, and handles high frequencies well. Vocals sound pretty good, and are definitely the focal point of playback. Which is great news for acoustic fans. Congrats, Google - you did something right. But, and it’s a big but, the bass response is seriously lacking. Not a surprise considering the tech, but disappointing for anyone listening to hip hop or rap. You won’t be able to enjoy bass-driven tracks like you could on the Sonos PLAY:5. It just doesn’t drive the lows like you want it to. This is a common downside with smart speakers, but Apple’s newly released Homepod is rumoured to be the answer to all our hi-fi prayers. If it can tackle the lows, it might just bump our Home out of rotation. Stay tuned, because we’ll be reviewing it soon. Side note: Within the Google Home app, there’s an EQ setting that lets you personalize your sound. It has two sliders - one for treble and one for bass. We’re not experts here, but we didn’t notice a considerable change in either. Nice try, though, Google. Like the speaker itself, the packaging is understated. It’s covered with a cardboard sleeve, and the box containing the speaker is all white with a flip-top lid. Despite being less flashy than some, it triggered a sense of excitement from our minimalist heart - the simplicity really created an air of mystery. When you open the top, the Google Home is perched neatly inside, resting on a small, plastic stand. Simple, elegant, cute, but not necessarily dazzling. Along with the speaker, you get a power cable and a manual. Unless you purchase the additional colored bases, the Home has zero accessories - a lot less fun than unboxing something a lot simpler, like the Shinola Canfield In-Ear Headphones (full review), which were packaged in style and came with a lot of extras. But, if you’re just going to sit the Home on the side of your desk, or on your bookshelf, you don’t really need accessories. On the plus side, you can keep the box for future storage, or even just something to put behind the speaker on your shelf, like we did. In our opinion, the Google Home is a useful little speaker, and is perfectly adequate for daily use - if you don’t mind sacrificing some sound quality. It’s best for anyone who prefers voice command over physical controls, which is a feature that Google managed to nail. Kudos. After all, that’s what the Home was designed for. Though the playback isn’t the greatest, the main focus of the Home is ease-of-use and convenience. Therefore, we weren’t too disappointed, and are happy to include the Home in our daily routine. However, we definitely won’t be recommending this speaker to our audio geek friends, or anyone looking for a killer bookshelf speaker. If that sounds more up your alley, we suggest you check out our roundup of this year's Best Bookshelf Speakers. Google won’t be making that list, not for a while, but there are some pretty fantastic little gadgets that could give you the sound you’re looking for - at least until someone releases a hi-fi smart speaker. If we had any recommendations for Google, other than sound quality, we’d like to see the two apps condensed into one, and better volume automation between platforms. Considering the Home is designed to make our day-to-day easier, we think these are pretty fair requests. It records everything you say, which is kind of creepy. Less than impressive sound quality - especially the lows. Sound customization through Google App doesn’t change much. No buttons other than mic on/off. The Sonos One is perfect for those who are already using Sonos devices. The One allows you to connect to other Sonos systems in your home and listen to music, hands-free. It also has built-in Amazon Alexa, and is compatible with Amazon Music, Spotify, and Apple Music. Unfortunately, like most of the smart speakers available, the One lacks the hi-fi quality we’re craving. We at least wanted to see an upgrade from the Sonos PLAY:1, but the sound is seemingly identical. It definitely doesn’t sound bad, but it’s not mind-blowing. Check back for our full, in depth review of the Sonos One soon. Amazon has released yet another smart speaker, but they’ve officially ditched their attempts at rebranding. Meet the Amazon Echo 2nd Generation. Though it’s slightly smaller than its predecessor, and offers some more customization options, the Echo has remained mostly the same. With built-in Alexa, it’s still useful as a smart speaker, and the voice command is a solid staple feature. But, as usual, the audio quality was overlooked. The new Echo isn’t the best for music playback, but it is one of the better smart speakers on the market - we’d sure hope so after all of Amazon’s attempts to reinvent the Echo. Check back for our full, in depth review of the Amazon Echo soon. The newly released, highly-anticipated Apple HomePod is currently the Google Home’s main competition. If you’re an Apple fan, you’ll probably make the switch as soon as the HomePod is available in your country, just based on brand preference. It’s already been released in the US, UK, and Australia, and is making waves in terms of sound improvement in the smart speaker world. The main difference between the Apple HomePod and the Google Home is the use of Siri rather than Google Assistant, as well as the connection to other Apple products. Plus, Apple apparently heard all of our cries for decent-sounding smart speakers, and claims that theirs is designed with listeners in mind. Let’s hope and pray that they followed through. Check back for our full, in-depth review of the Apple HomePod soon.